This recipe I have here is a good welcoming dish for the year of the rooster! If you have eaten in the Hainanese Delights fast food, I think the Hainanese chicken is their specialty. I have tried that dish many times and I always order that whenever I eat on that fastfood. Its because I love the dipping sauces like the grated ginger with oil and also the chili paste and soy sauce. But whenever I took my wife there, she doesn’t like that dish because she thinks its still raw. Sometimes I think it is kind of half cooked because I can sometimes see the bones still have fresh blood. And the taste is a bit bland. Anyway this recipe I have here is proven to taste so good that I’m sure you will love the taste. You can also cook it thoroughly and well done as per your preference. The best thing about this recipe is the simplicity where you don’t need to buy hard to find Chinese condiments and herbs. To cook the Hainanese Chicken; Rub the chicken parts with rock salt and set aside. In a medium size pot, combine water, lemon grass, ginger, onion, salt and pepper. Bring to a boil then add the chicken. Simmer for about 35 minutes or until the chicken is tender. In a medium size pot, combine water, lemon grass, ginger, onion, salt and pepper. Bring to a boil then add the chicken. Simmer for about 35 minutes or until the chicken is tender. Turn off heat and let the it cool for a while. You will use the broth for the Hainanese rice later. In the meantime, to make the Hainanese rice, in a wok, heat margarine and saute onion and garlic until fragrant. Wash the rice first then drain. Put the rice in the wok together with the onion and garlic and saute continuously for 5 minutes. Then transfer the sauteed rice to the rice cooker and add the chicken broth. Cook until the rice is done. To make the ginger dipping sauce, grate the ginger and put in a small bowl. Add the oil and salt. Mix thoroughly and set aside. In a separate bowl, put the soy sauce and kalamansi juice. Serve these dipping sauces with the Hannanese chicken. Garnish with green onions if desired. 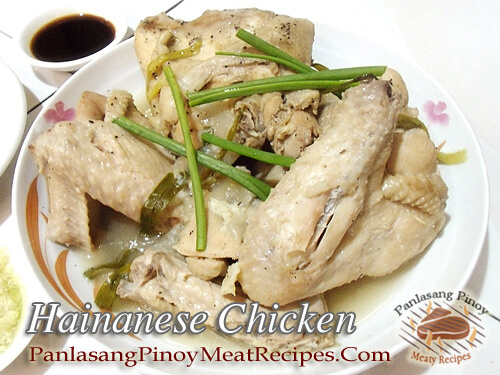 I tried cooking this Hainanese chicken recipe and it taste delicious and the ingredients are easy to find. Hi Rebecca, thanks for your comment and I hope you will try to cook it again. Tried this, and it was good. I mean just the rice alone tastes great and smells great! Hi Olenna, thanks for trying this recipe! I really appreciate it!